Although I would never claim to be the most clean or organized person in the world, I am pretty OCD when it comes to organization and keeping things neat. I feel my chest closing in and a lack of oxygen flowing to my brain when I look around the house and it's disastrous or I can't find something I KNOW we have. But most of the time KEEPING things organized is more of a challenge than actually organizing them. So, today I'm sharing 5 tips on how to stay organized. For me this is crucial. At night before bed or first thing in the morning I make a list of what I want to accomplish that day. This is the extra stuff. The stuff I do in the down time. My day to day is ingrained in my brain. (More on that in a minute.) Some days I complete the list and some days I move stuff to the next day. But every day, I need to have a visual of what I want to accomplish. This doesn't mean that there aren't days that you stay all day in your pajamas, or let the kids sleep in later than usual. I totally have those. But as a general rule, I stick to a schedule. Waking up, school, lunch, naps, chore time, dinner, and bed are all usually done at the same time. If I don't stay on a schedule, I see my day falling apart and I don't get half as much accomplished. I heard my mom say this a million times growing up and now I lovingly say it to my kids, which I'm sure they love as much as I did as a child. But really, it's amazing to me how much stuff accumulates on my counters, the back of the couch, coffee tables and kitchen tables. Taking the extra 5 seconds to put something back where it belongs keeps things nice and tidy in the long run. 4. Stay on top of it. Every night before bed I have a cleaning time. The kids take 15 minutes and get their rooms clean and I take about 30 minutes to pick up the rest of the house and run the vacuum cleaner. One thing that totally throws off my day is waking up to a messy house. Starting out clean gives you a fresh slate to begin your day with. 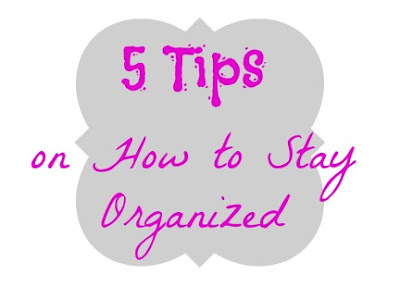 Being organized doesn't necessarily mean you don't have clutter. Go through your kitchen and pack up items that you don't use on a regular basis. Then put them in a safe place and see how long you go without using them. If its 6 months or more, you probably don't need those things. Do this with every room of the house and you will be amazed at how much "stuff" you really don't need. What are some of your tips on staying organized? 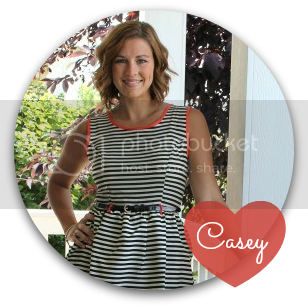 These are some GREAT tips, Casey! I love the idea of sticking with a schedule. I think since we only have one child and she's old enough to just do what we do, we are bad about being a home and doing things. I need to be better about that! I LOVE this post! I think we are related! Ha! I feel tightness in my chest when things are a mess! I am going to start making a list like you suggested every evening. What a great idea! Thanks for sharing! I follow #3 and #4 religiously! My house always looks clean, even if it isn't completely dusted or mopped!